It was back in January of 2018 that Swedish provider NetEnt signed a deal with Gaumont, the French film studio behind Netflix gritty crime drama Narcos, to produce a branded slot game based on the Golden Globe and Emmy award-nominated television series. 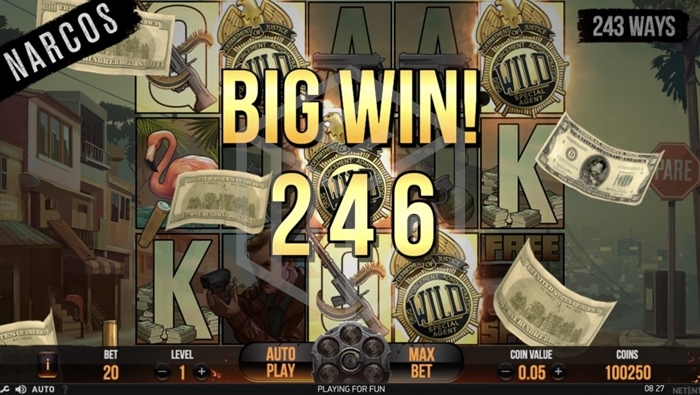 A full year and a half later on 23rd May 2019, the game will finally hit the online casinos. So has the wait been worth it? The first two seasons of Narcos charted the rise of the notoriously ruthless Colombian cocaine kingpin, Pablo Escobar. As such Narcos the slot is set on the mean streets of Colombian capital Medellin where drugs, money and gangsters blood all flow freely. Narcos is played on a 5x3 reel set and uses a 243 ways to pay mechanic. It’s a medium/high variance slot with a max win of 1506x the stake, playable from €0.20 to €400 per spin. 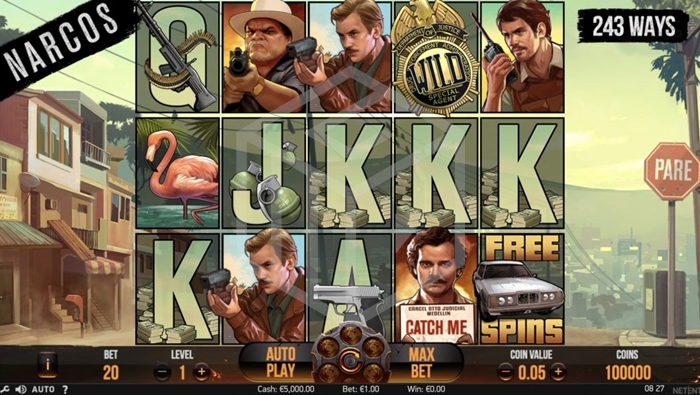 The biggest wins come from a scatter triggered free spins round, but Narcos is rich on side features with titles such as “Drive-by”, “Locked Up” and “Walking Wilds”. You’ll learn more about them a little later on in the review. For now, let’s check out how NetEnt’s artwork for Narcos shapes up. NetEnt have really gone for it with regards to the design work for Narcos. The graphics, animations and sounds very much mimic the style of Grand Theft Auto and there are a variety of settings where the slot action takes place. The base game takes place on a Medellin street high on a hill overlooking the city with residences and shops to the left and a tree lined sidewalk to the right. The road runs through the middle of the screen and is mostly obscured by the translucent game board. Other background settings which come into play during bonus features are outside a nightclub where a shootout is underway and overlooking Pablo Escobar’s private prison. The low value symbols are J-A with each either toting a gun, a grenade, or surrounded by piles of cash. Mid value symbols are flamingos and Cessna jets (often used to run drugs from South to North America). The high value symbols are all characters from the TV show; Real life drug baron José Rodríguez Gacha, and the fictional Connie Murphy with DEA agents Steve Murphy (Connie’s husband) and Javier Peña. Murphy and Peña are the highest paying, awarding 15x stake for 5 in a row. The wild is a DEA badge, the free spin scatter is a car, and there is also a Pablo Escobar symbol which triggers one of the side features discussed below. As well as the main free spins bonus round there are base game features (Walking Wilds and Drive-by) and a second triggerable bonus round, Locked Up. Walking Wilds are a familiar feature and have been used by NetEnt to great effect in the likes of Jack and the Beanstalk. Wild symbols which form part of a winning combo trigger Walking Wilds. The wild(s) stay on the reels and shift one place to the left with each spin. The spinning continues until there are no winning wild symbols remaining on the reels. This is a randomly triggered base game, heralded by the arrival of a car full of gun-toting gangsters. As the car approaches the game board, a heavy-set goon opens fire on the reels. The resulting bullets transform any high value symbols the hit into wilds. This feature is triggered when 3 or more Pablo Escobar symbols land on the same row. The background changes to the flooded private prison which Escobar had built for his own incarceration. The reel set also changes and now only contains Escobar “Locked Up” symbols and Golden Briefcases (along with a lot of empty spaces on the reels). Multiplier – all wins in the cluster are multiplied by x2 or x3. Big Starting Value – the Golden briefcase symbol is given an extra starting value. Free spins reset to 3 every time a new symbol is added to an existing cluster. A win of up to 271x the stake is available via the Locked Up feature. Ten free spins are triggered by landing scatters on reels 1, 3, and 5. During the free spins round the Drive-by feature occurs with each spin. As such the Walking Wilds feature will also often come into play. A win of up to 1506x the stake is up for grabs through Narcos Free Spins. This is another top drawer slot from NetEnt and I’m happy to report that it was well worth the wait. The visuals are amazing from top to bottom and NetEnt’s design team have really captured the essence of the TV show. The animations, the different scenes, and the sound effects are all spot on. There are also a ton of fun features to keep you immersed in the game. I especially enjoyed Locked Up which has a decent frequency. If I were to have to pick a small gripe it would probably revolved around the free spins bonus. As they only come around on average every 271 spins I would have liked to have seen more potential from them than a max win of 1,506x the stake. That said, this is only a medium variance slot and there are plenty of other features which can pay quite nicely. Just like they did with Vikings back in November, NetEnt have delivered another fantastic branded TV slot. Great job! Check out our casino bonuses section for a list of top rated online casinos, all of which allow you to try their slot games for free. We add new reviews to our database and update it with fresh content every single day. Go ahead and have a look in our online slots section.